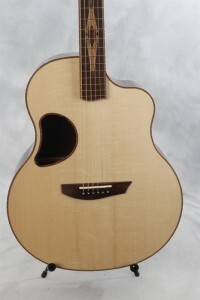 Specs include: MG body shape, 16″ lower bout, 4″ depth at neck block and end block; figured Brazilian rosewood back, sides, fingerboard, bridge; master grade Adirondack spruce top with extra large sound hole and exclusive bracing pattern; 1-3/4″ mahogany and carbon fiber neck with cantilevered neck joint and floating fingerboard; 2-3/16″ string spacing; figured koa binding; bone nut and compensated saddle; Robson tuners; wooden art deco fingerboard and headstock marquetry; wooden mosaic of 1930s Manhattan skyline inlaid on the back. McPherson guitars are a cut above many other brands, even at the basic entry level. But with the tonewoods featured on this guitar, along with the spectacular wooden marquetry, things have been taken way up. And I mean, like on an express elevator to the top of the Empire State Building – an impression of which appears on the expansive back of this very impressive example of the guitar making. Using only wood of varying color, texture and grain patterns, Master Luthier Eric Pelton has recreated a tableau representing the skyline of Manhattan circa 1931, the year construction finished on the Empire State Building, the tallest building in the world at that time. Skyscrapers of Hawaiian koa wood stand out from a sky of figured red rosewood and jet black ebony, under an art deco sunrise. A darker rosewood East River rolls by a maple waterfront of smaller buildings, with various shades of wood used to provide depth and contrast, including billowing smoke rising from chimneys and the puffing stack of an ebony tugboat chugging its way up the river. 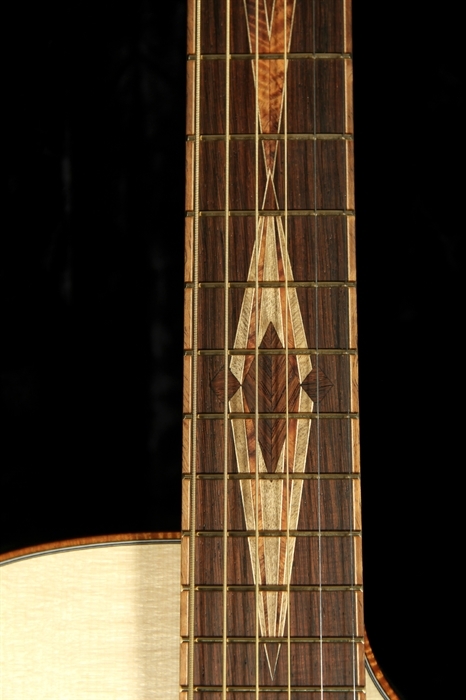 The entire mosaic is ringed by an oval koa frame, and topped by the ornamental art deco crest that ties it all into the gorgeous marquetry of multicolored wood inlaid across the fretboard and up into the face plate of the headstock, fanning out beneath the McPherson script logo, also made of colorful wood. The hues and pattern employed to achieve the arresting wood embellishment brings to mind the exquisite interior design of the Chrysler building – that other icon of mid-century Manhattan that arose at the same time as the Empire State Building. It remains a singular icon of how much soul and creativity can be built into a functioning, busy workspace. And within the decorative layers seen on this impressive edifice of modern design and construction, is a musical instrument that is both practical and exceptional. The standard McPherson guitar shape is anything but standard. There is an organic feeling to the asymmetrical look, with its undulating lines that dip and swell around the silhouette, made all the more unusual by the placement of the kidney-shaped sound hole, near the relatively shallow waist, just above the bass strings. All McPhersons with the MG designation have the same size top, fully 16″ at the widest point, but the XP indicates a larger sound hole than normal. And when it comes to depth, they are all 4″ deep at the neck block, but may vary in depth at the end block from 3″ to 5″. Only the 4.0 models have the same 4″ depth from stem to stern, like traditional guitars. And a meticulous blending of the traditional with the innovative is a big part of McPherson’s design philosophy. Nowhere is that more readily apparent than with a guitar like the Manhattan Skyline. 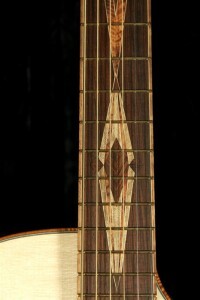 Brazilian rosewood with Adirondack red spruce was the preferred tonewood pairing at the time the 14-fret steel string guitar debuted during the same years the Emp was rising over the Big Apple. And the rosewood on this guitar displays the kind of figuring to the grain that shows why Brazilian was so desired for its visual beauty, as well as its marvelous tonality. Of all the rosewoods, Brazilian is coveted above the rest because it radiates the most colorful spectrum of harmonic complexity, along with considerable richness and depth. And yet it maintains precise definition all way down to the darkest recesses of the rosewood cellar, allowing the elaborate array of sonic colors to be perceived clearly. And when it is paired with Adirondack spruce, it receives an engine of power, projection and refinement that acts as a sharp-focus lens, promoting the smallest details of the complex Brazilian voice with startling clarity. Like the rosewood back and side, this red spruce top is of very high quality. It is seriously stiff even by Adirondack standards, which was indicated by the abnormally pronounced medullary rays, and arcs of hazelficte markings, bringing to mind the fronds of a fern, as they leap out in either direction from the center of the top. From my experience, I have learned that the stiffest Adirondack tops frequently make for the best sounding guitars, even if they take longer for the top to open up, as the cellular structure breaks down, and then gets down to serious singing. At first, it is like the harder one plays such a guitar the more abruptly the sound bounces off the super-stiff top, or sort of skips along the surface of the voice like a flat stone across a lake. But as the guitar breaks in, the energy from the played strings actuates the top to reach deeper and deeper into the voice, to mine more and richer tone, which it then launches into sonic outer space. I am privileged to be the first person to take this instrument through anything like real playing, and I was impressed with how lovely it sounds, being so very new with a top so very stiff. Here are heard the solid, clear McPherson fundamental notes that stand up from the strings, tall and strong. Already the high harmonics ring bright and steady. Lit by the fundamentals, they then take hold of the sound and extend it in an effortless transition, with a purity to the sustain that makes it hard to tell where a fundamental note dies and a sympathetic harmonic takes over, like relay racers achieving a flawless hand-off. The newness of this top is most noticed at the bottom end. In that Adi way, the lowest bass note pops out from the string, yet is still rather shy when it comes to the undertone resonating beneath it. But just in the few minutes I played this guitar, the bottom end started to uncoil, and it should soon be on its way to the deeper, rounder fullness heard in McPhersons that have some playing time under the hood. There is already considerable presence spreading out from the midrange, with a palpable 3D quality filling the center of the undertone, emanating from the G string and to a lesser extent the D string. It is the sonic equivalent of a flame atop a candle, alive and filling otherwise empty space – translucent, but with intense color and palpable warmth. That colorful glow inhabits the midrange most noticeably, but it will spread out across the entire tonal spectrum as that brand new Adirondack spruce top opens up, particularly in the bottom end. And even now the potential energy trapped inside that stiff red spruce can be felt, it not yet fully heard. Playing this guitar was like knocking on the door of a spruce stable full of horsepower, chomping at the bit and so eager to sink its weight into that rich, fertile Brazilian tonewood, with its peppery, rose oil scent rising from the sound hole like freshly turned earth. The future owner of this McPherson Manhattan has my envy as the player whose personal style will most influence the training and feeding of this thoroughbred, as it comes into its own as the champion it so obviously will become. The natural aural properties of these superb tonewoods are only the foundation a great guitar. It is what the luthier does with them that matters most. In this case, their potential has been harnessed, refined, and projected in the way they have, because of how McPherson builds their guitars, with a unique take on neck construction, and a bracing scheme unlike any other. Many high-end guitars feature a body of Brazilian rosewood topped by red spruce. But McPherson extends this marriage of warm, complex Brazilian and clear, ringing Adirondack to the bracing that supports both. Each strut is a laminated sandwich of Brazilian rosewood with a layer of Adirondack spruce on either side. The lamination provides considerable strength and stiffness, while the molecular structure of each layer influences and transfers energy in its own way, unlike braces made of a single piece of wood. None of the top braces touch each other. Instead, they pass over, under, or through portals cut in other braces. But each brace is set into a channel carved into a thin layer of spruce glued to the soundboard, so the vibration of any individual brace affects the others. 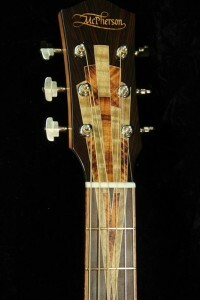 On the outside, the cantilevered neck is stunning to look at, as an impressive example of creative design, with dynamic lines to an architecture made of beautiful mahogany bound with lively koa, and glistening under the high gloss lacquer; roofed by a Brazilian rosewood fretboard, set with gold EVO frets and the delicious art deco inlay. The area where the neck doesn’t quite meet the body, and the fingerboard doesn’t meet the top, looks almost like a model of some large postmodern building at the World of Tomorrow. And on the inside are found the workings of futuristic technology worthy of a world’s fair. Most of the neck is actually made out of military grade carbon fiber, covered in a two-ply layer of wood that offers good looks to the eye and comfort to the player’s hand. And the neck joint in and of itself is an extraordinary example of modern engineering, with a triangular support system of brass and steel housed inside the wooden heel. To learn more about the exclusive bracing and neck technology used on all McPherson guitars, go HERE. The serious stiffness and mass of the bolt-on, carbon fiber neck and floating fingerboard result in most all the energy from the strings passing into the guitar’s body by way of the bridge, which transfers it to a rosewood bridge plate and the intricate bracing. That gets the top moving and all that energy passing through and too the rosewood body with each note leaping off the guitar with immediacy, clarity, and focused, unwavering sustain. Medium gauge strings are recommended for the McPherson MG size guitars, to provide maximum energy and take full advantage of the special bracing, the very stiff neck, and wide bridge plate. And while this guitar sounds lovely when played lightly, it does not require delicacy on the part of the player. In fact, it very much responds to high energy playing with loads of full-bodied volume. It is understandable that a guitar with this sort of aesthetic beauty might make someone hesitant to go at it with a heavy flat pick, let alone metal fingerpicks. But thanks to the floating fingerboard, it is not really an issue at all. 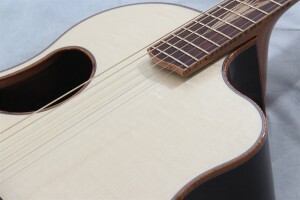 The strings rise upward at an angle as they leave the saddle, and by the time they reach the area where they produce the best tone – basically below the center of the sound hole and a touch toward the neck – they stand out away from the spruce top, much more than on a typical acoustic guitar. It felt a little funny at first, to be playing strings so far out in front of the soundboard, but I came to like it very much after only a short while. The fit and finish of a McPherson guitar is unsurpassed. It does not look, feel, play, or sound quite like any other guitar. But this Manhattan Skyline model is exceptional even by the standards set at McPherson. The late Stan Jay was known for his preference for traditional fretted instruments. But he absolutely loved McPherson’s guitars, above and beyond any other modern innovator of progressive luthiery, and he proudly bought a fine example for his very own. 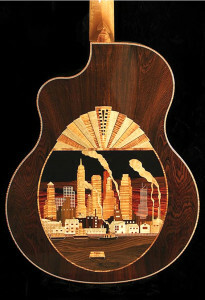 Stan ordered this Manhattan Skyline guitar to sell, among many other McPhersons. But he did not live to see it completed. I can almost hear the sort of gleeful giggle that would have escaped the otherwise dignified owner of that dream fulfillment center called Mandolin Brothers, had he been allowed to open the case and sit down to play this spectacular work of working art. The guitarist who ends up owning it will likely respond similarly, every time they see the spectacular woods, and mine the sonic riches to be found therein.